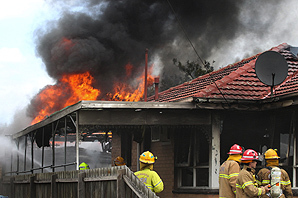 A Noble Park family of six is homeless after their house was gutted by fire in Percy Street this afternoon. A female resident, aged in her 30s, returned to find the home on fire after picking up her children from school. She was given oxygen and treated for stress and shock by paramedics at the scene, a CFA spokeswoman said. The mother was taken to hospital for observation. None of the occupants were in the house at the time of the blaze, which is believed to have started in the kitchen. CFA district 8 operations officer Mark Kennedy said 85 per cent of the house had been destroyed by the ‘‘intense’’ fire, which was fanned by strong winds. The fire spread through the roof and engulfed an adjoining carport and a backyard shed. ‘‘The house will be a complete loss,’’ Mr Kennedy said. He said it took 20 firefighters from Springvale, Dandenong and Clayton about 40 minutes to control the blaze, which was reported at 3.07pm. The crews protected a neighbouring house, which received minor damage to its fence and guttering, he said. The family is being assisted by police to find emergency accommodation with relatives and friends.